Allah is the Creator of everything; He dominates with His power the earth and the heavens. Holy, He is, and Praised, the Lord of the angels and of the spirits. His favours overwhelm whatever He creates, and He is the Mighty over whatever He initiates. He observes all eyes while no eye can observe Him. He is Generous, Clement, Patient. His mercy encompasses everything, and so is His giving. He never rushes His revenge, nor does He hasten the retribution they deserve. He comprehends what the breast conceals and what the conscience hides. No inner I thought can be concealed from Him, nor does He confuse one with another. He encompasses everything, dominates everything, and subdues everything. Nothing is like Him. He initiates the creation from nothing; He is everlasting, living, sustaining in the truth; there is no god but He, the Omnipotent, the Wise One. I further testify that He is Allah before Whom everything is humbled, to Whose Greatness everything is humiliated, and to Whose Dignity everything submits. He is the King of every domain and the One Who places planets in their orbits. He controls the movements of the sun and of the moon, each circles till a certain time. He makes the night follow the day and the day follow the night, seeking it incessantly. He splits the spine of every stubborn tyrant and annihilates every mighty devil. I asked Gabriel to plead to the Peace to excuse me from having to convey such a message to you, O 1 Fixed verses are those which are never abrogated; the injunction(s) they contain remain valid forever. people, due to my knowledge that the pious are few1 while the hypocrites are many, and due to those who will blame me, and due to the trickery of those who ridicule Islam and whom Allah described in His Book as saying with their tongues contrarily to what their hearts conceal, thinking lightly of it, while it is with Allah magnanimous, and due to the abundance of their harm to me, so much so that they called me "ears" and claimed that I am so because of being so much in his (' Ali's) company, always welcoming him, loving him and being so much pleased with him till Allah, the Exalted and the Sublime One, revealed in this regard the verse saying: " And there are some of them who harm the (feelings of the) Prophet and say: He is an ear (uthun; i.e. he always listens to' Ali). O people! Comprehend (the implications of) what I have just said, and again do comprehend it, and be (further) informed that Allah has installed him (' Ali) as your Master and Imam, obligating the Muhajirun and the Ansar and those who follow them in goodness to obey him, and so must everyone who lives in the desert or in the city, who is a non-Arab or an Arab, who is a free man or a slave, who is young or old, white or black, and so should everyone who believes in His Unity. His decree shall be carried out. His (' Ali's) word is binding; his command is obligating; cursed is whoever opposes him, blessed with mercy is whoever follows him and believes in him, for Allah has already forgiven him and forgiven whoever listens to him and obeys him. O people! This is the last stand I make in such a situation; so, listen and obey, and submit to the Command of Allah, your Lord, for Allah, the Exalted and the Sublime One, is your Master and Lord, then next to Him is His Messenger and Prophet who is now addressing you, then after me 'Ali is your Master and Imam according to the Command of Allah, your Lord, then the lmams from among my progeny, his offspring, till the Day you meet Allah and His Messenger. O people! Prefer' Ali (over all others), for he is the very best of all people after me, be they males or females, so long as Allah sends down His sustenance, so long as there are beings. Cursed and again cursed, condemned and again condemned, is anyone who does not accept this statement of mine and who does not agree to it. Gabriel himself has informed me of the same on behalf of Allah Almighty Who he said (in Gabriel's words): " Anyone who antagonizes' Ali and refuses to accept his wilayat shall incur My curse upon him and My wrath." "... and let every soul consider what it has sent forth for the morrow, and be careful of (your duty to) Allah" (Qur'an, 59:18), "And do not make your oaths a means of deceit between you lest a foot should slip after its stability" (Qur'an, 16:94), " Allah is fully aware of all what you do" (Qur'an, 58: 13). O people! ' 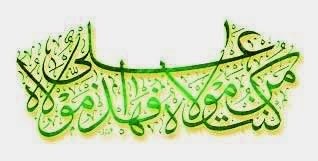 Ali and the good ones from among my offspring from his loins are the Lesser Weight, while the Qur'an is the Greater One: each one of them informs you of and agrees with the other. They shall never part till they meet me at the Pool (of Kawthar). They are the Trustees of Allah over His creation, the rulers on His earth. O people! " Fear Allah as Re ought to be feared, and do not die except as Muslims" (Qur'an, 3:102). O people! " ...Believe in what We have revealed, verifying what you have, before We alter faces then turn them on their backs or curse them as We cursed the violators of the Sabbath" (Qur'an, 4:47). By Allah! Redid not imply anyone in this verse except a certain band of my sahaba whom I know by name and by lineage, and I have been ordered (by my Lord) to pardon them; so, let each person deal with ' Ali according to what he finds in his heart of love or of hatred. This reference to the sahifa has been overlooked by most people with the exception of a small band, and we will, Insha-Allah, shed a light on this sahifa later on. The Prophet continued his historic sermon thus: O people! I am calling for it to be an Imamate and a succession confined to my offspring till the Day of Judgment, and I have conveyed only what I have been commanded (by my Lord) to convey to drive the argument home against everyone present or absent and on everyone who has witnessed or who has not, who is already born or he is yet to be born; therefore, let those present here convey it to those who are absent, and let the father convey it to his son, and so on till the Day of Judgment. Then the Prophet recited the entire text of Surat al-Fatiha and commented by saying: It is in my honor that this (Sura) was revealed, including them (the Imams) specifically; they are the friends of Allah for whom there shall be no fear, nor shall they grieve; truly the Party of Allah are the winners. Indeed, it is their enemies who are the impudent ones, the deviators, the brethren of Satan; they inspire each other with embellished speech out of their haughtiness. Thus did the Prophet of Allah speak on behalf of the Almighty Who sent him as the beacon of guidance not only for the Muslims but for all mankind. But the question that forces itself here is: "What happened after that historic event? Why did the Muslims forget, or pretend to have forgotten, their Prophet's instructions with regards to' Ali and "elected" someone else in his stead? To answer this question requires another book, and indeed many such books have been written. May the Almighty grant all of us guidance, and may He count us among His true servants who recognize the truth when they see it, who abide by His tenets, Who revere His Prophet and follow his instructions in all times, in all climes, Allahomma Ameen.